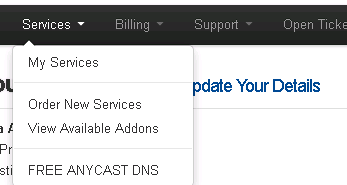 Anycast DNS (Yes, we heard you !) - Prometeus - Your 'net consultants ! Links to great tutorials and original contributions. Don't know how to setup your VPN ? How to install a panel ? How to tweak yout VPS ? Check here and ask if you don't find what you are looking for. While we do have our own DNS since more than a decade, we offered no access to the VPS customers on the basic assumption they can use their own or third party ones. They provided us with an WHMCS plugin so you can use it directly from within WHMCS as long as you have an account with us. Their network is full anycast all around the world for lowest latency. Now to the practical part, the tutorial. Do not forget to add our DNS servers in your domain panel (usually available in the panel from the company that sold you the domain). Do not add the domain such as "www.domain.com", but only as "domain.com". You will add the subdomains later, you can add http://www.domain.com, ftp.domain.com, any kind of subdomain.domain.com. Here is a list of the types of DNS records and what each does. Enjoy another free service we offer our customers along with free ftp space and many special (even free) deals ! Some of my domains were still registered using Crazydomains.com.au, so when I entered the dns, it will automatically search the IP of the dns. But when I try to enter ns1.dnsiw.com - ns3.dnsiw.com, the IP not appear. Cant you put the IPs by hand ? emilv1975 wrote: Does it support DNSSEC? Yes, but you will need to send-in a ticket to have it manually enabled. ErawanArifNugroho wrote: Some of my domains were still registered using Crazydomains.com.au, so when I entered the dns, it will automatically search the IP of the dns. But when I try to enter ns1.dnsiw.com - ns3.dnsiw.com, the IP not appear. Your service are support secondary DNS ? I'm interested in the transfer 3 domains. For 2 domains required DNSSec, who to contact for their subsequent activation ?